I am pleased to announce the official release of my first eBook A Photographer’s Guide to the Ontario Landscape, with foreward by Mike Grandmaison,the first-ever comprehensive guide to photographing the province’s landscapes.There are many outstanding photo destinations throughout Ontario’s vast and varied landscape and I have compiled many of them, from the Abitibi Canyon to Point Pelee, the Ottawa Valley to the Algoma Highlands and beyond, within this easy-to-read, easy-to-follow guide, complete with driving directions to each of them. 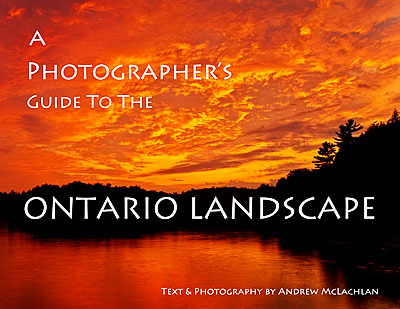 When I began photographing the Ontario landscape I wish there was a resource such as this available to me. I have spent countless hours searching the internet, studying road maps, and meandering down backroads in hopes of finding inspiring landscapes to photograph. As a result, I chose to write this guide to simplify the process for others. While this is ebook is about Ontario landscape locations, I have also scattered dozens of tips throughout that will help you create stunning landscapes of your own, wherever you live. This ebook, has been published by Birds As Art Books and is available exclusively through the Birds As Art on-line store. Click here to read the official release of this eBook in the Birds As Art Bulletin #393 and here to purchsae your copy of A Photographer’s Guide to the Ontario Landscape. I would also like to thank those who help with the review and editing process of this guide. Their constant encouragement and inspiration was instrumental in me writing this ebook. I greatly appreciate all their hard work. With special thanks to Arthur Morris, Denise Ippolito, Gregg McLachlan, Mike Grandmaison and Mike Hannisian.